We were graced with Ed’s presents presence at our December ’12 meeting. 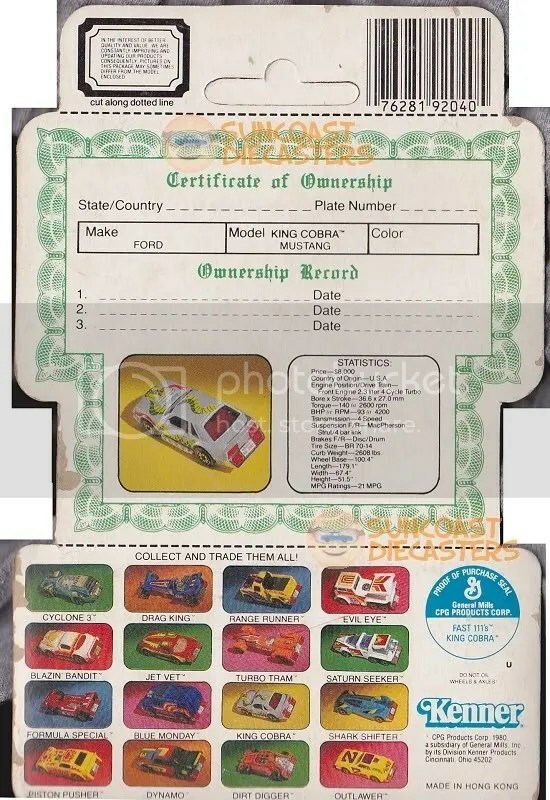 Ed brought in a fabulous show-off item: this original (and I mean original) Mighty Maverick — not only carded, but on the wide card with Collector’s Button. 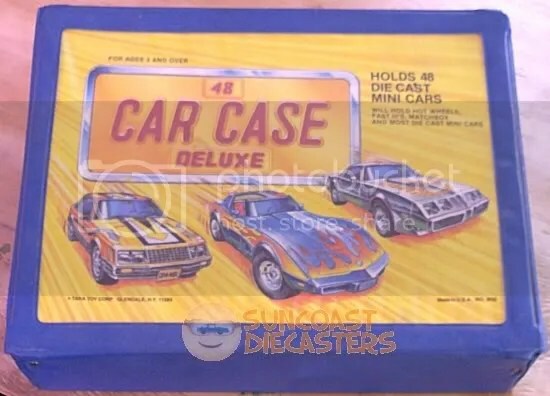 (Yeah, not-for-sale show-’em-off items are verboten at Suncoast Diecasters meetings but, eh, it’s the holidays.) Note also that the card is unpunched. Drool, drool. Ed, as usual, done brought a scrumptious selection of goodies, one of which was this fully-loaded collector’s case, which Ken snapped up forthwith. How many delicious classics can you name? 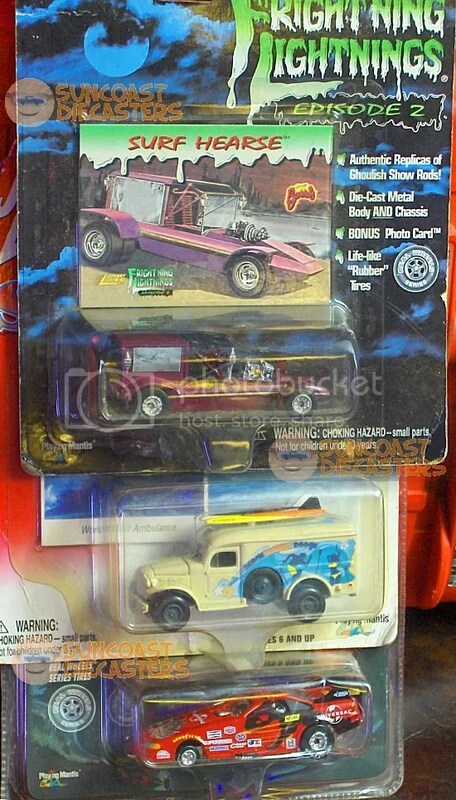 I see Cosmobile (both red and blue); Planet Scout; Baja Buggy; Tow Joe…. 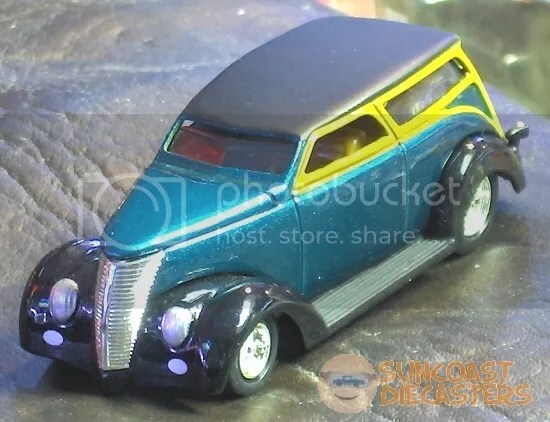 When I spotted this pseudo-woodie among Ken’s kars, I presumed it was Extremeliner. Turns out it’s Boxotica. And now it has another name: mine. …But as you can see, I got far, far more than mere more storage. 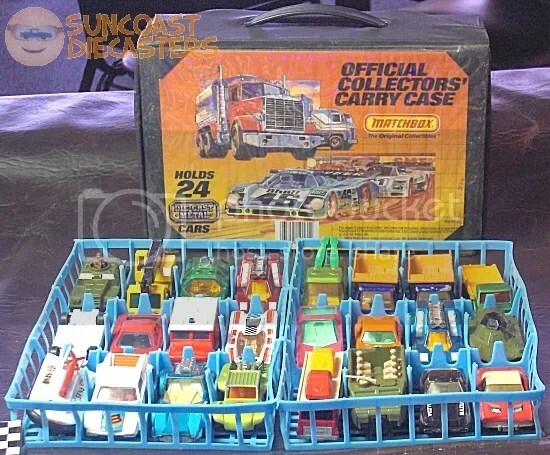 Even if I decide to part out all of these cars, the case itself was an outrageous bargain. RAOK. Complete and total RAOK by Ed to me. It was near the end of the December meeting; folks were starting to pack up their stuff. I headed over to the table where I’d had lunch, to gather some items I set there. Much to my very great surprise, these three MOCs were lying there. As I was looking them over, I noticed Ed out of the corner of my eye, with a big ol’ sheepish grin on his face. His Christmas gift to me. (No, the cars, not the sheepish grin. Although … No.) I even tried to hand a few Georges to him, but he refused. Ed, may the Good LORD bles you and keep you, brother. 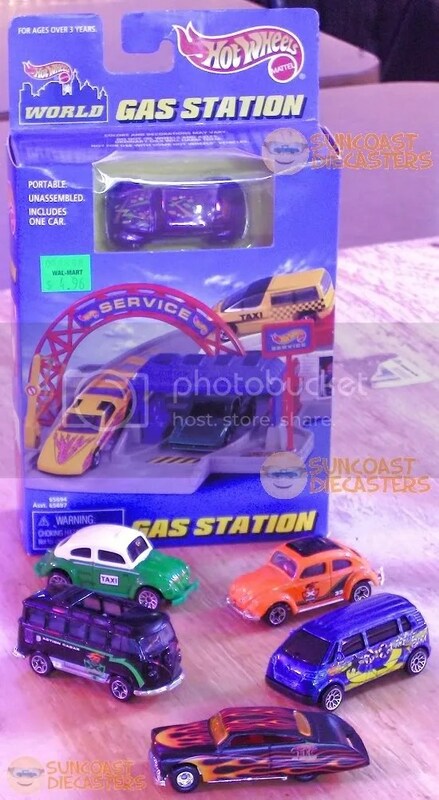 New old stock: A local Walmart got a shipment of Hot Wheels which must’ve been gathered from loose warehouse lots. The assortment featured a range of older models, some going at least as far back as 1998. 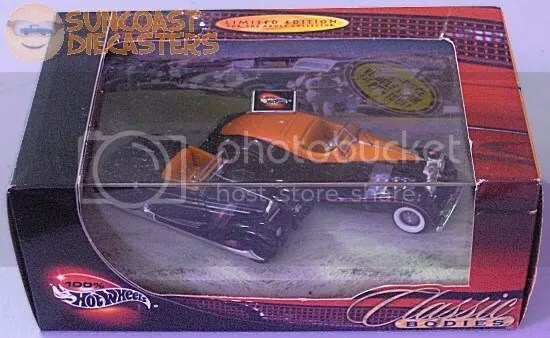 Among them I found this 2002 MOC Open Road-ster, which I offered to Kenny, who rejected it in favor of other new old stock (see below). So, I offered the OR to Bill, and he happily accepted it. What? Oh, yeah, Bill also picked up an Auburn 852 and a Jeep CJ-7. 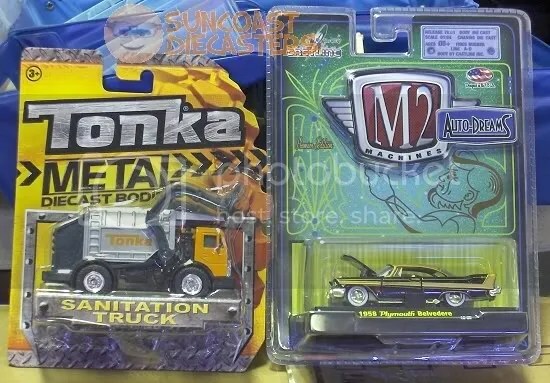 Ken acquired this garbage sanitation truck, as well as this smartly appointed ’58 Plymouth Belvedere. And because it’s named so, I get to do this, because it’s funny: Oh, Belvedeah! Come heah, boy! As I said above (see above), Kenny rejected the Open Road-ster in favor of this fellow, which I’d not seen before the Great Walmart Time Shift. By the way, I’d originally offered this to Big Tractor Mike, who rejected it in favor of … um … empty hands, I guess. What!? That background doesn’t look like the Sports Bar (& Grill)! No, much to my chagrin (which is not like a normal, happy grin), the photos I took of this truck were too badly out of focus to use. (I’m pretty good about checking tight close-up results on my camera’s screen; don’t know how I let this one slip by.) So, because the truck is very cool and because I very much wanted at least one photo of it in this Gallery update, I e-mailed Ken to see what he could do with his fancy-shmancy new camera. Turned out he got several high-quality shots, including that artsy perspective shot in the lower half of the frame. My other shot that failed. I’d not heard of this manufacturer before this, and I wanted it too in the Gallery. Ken’s camera came through nicely here as well. 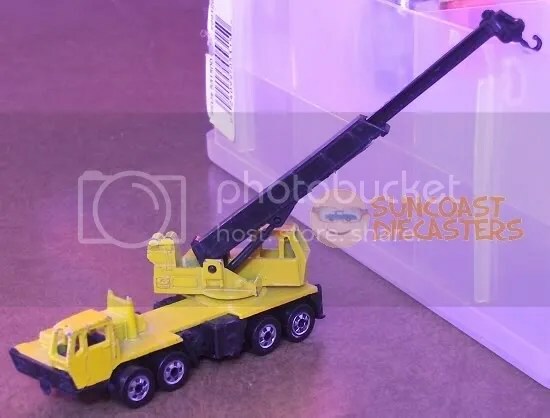 And now you know what they did with all that left-over clear, lightly carbonated, alcoholic beverage: they mixed a thickening agent into it and cast toy trucks out of it! 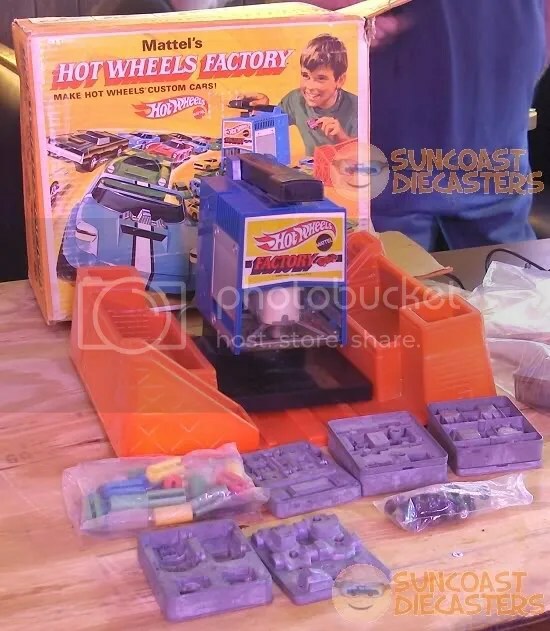 Bob done did himself and the whole club proud with this magnificent acquisition: the Hot Wheels Factory, a hot-melt injection molding system for casting your own Hot Wheels cars. (Well, casting the designs provided by the plates.) This kit is nearly complete, even having the stickers and some of the original paints. Yes, bottles of paint were included as well! 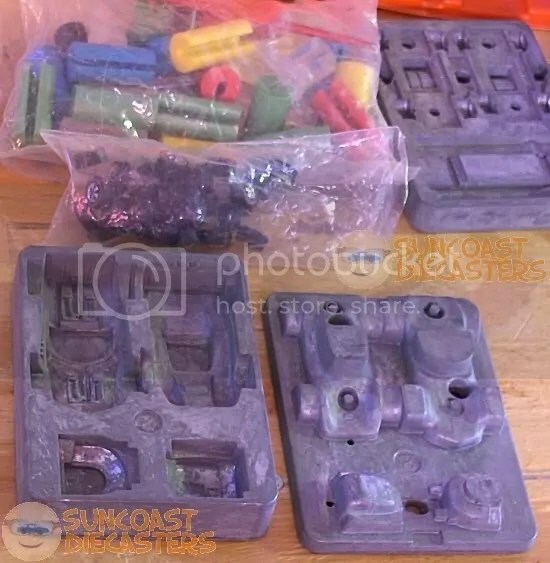 Mattel had several hot-melt craft kits available, such as Thinkmaker and Vac-U-Form. Imagine it: a kid not only owns this set, but his dad also has a tool shop in the garage … Pops could machine custom molds for Junor! He would then be King of all Hot Wheels! A drill needs bits, and the Hot Wheels Factory needs these bits. 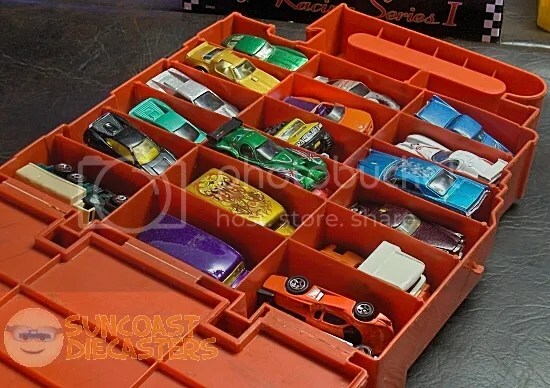 Here we see the two-piece tray set which forms the cars, as well as the bag of colored plastic slugs which, um, also form the cars. And no, I have no idea what specific models come out of this tray. 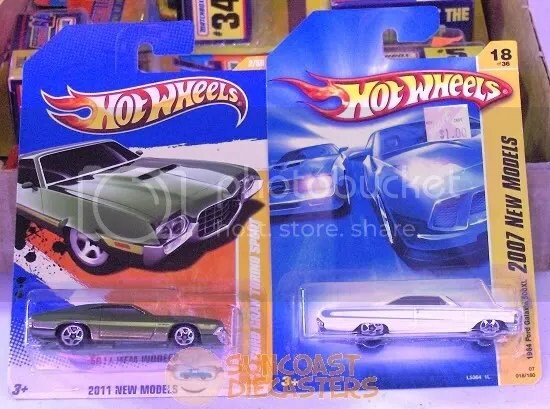 (They may not even be, you know, “actual” Hot Wheels models — in other words, Junior might not be casting his own fleet of Cheetahs on Dec. 26th.) Note the smaller areas in front of the car body shells – that’s where the windows were cast. Yes, if you look carefully near the upper right corner of the pellet bag, you’ll see a clear slug for making clear windows! And finally, what good is a toy car without toy wheels on which to roll? The small bag in the more or less middle of the pic contains wheel-and axel sets for to be making your car to move. 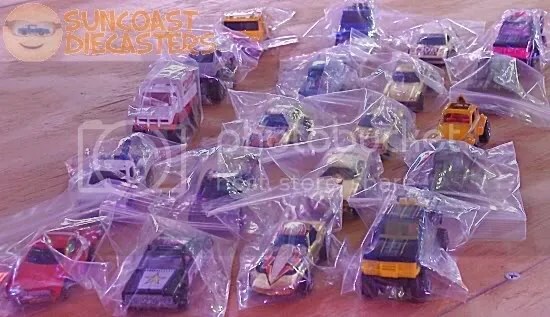 Indeed, indeed, friend, the Factory came with its own Bag-o’-Redlines! A RAOK from Ken, and a pseudo-RAOK from Big Tractor Mike. Ken’s been going through his collection, indexing, culling out duplicates, and generally making a project of his hobby. 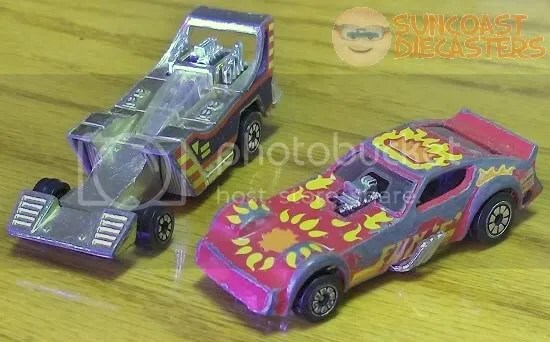 He found the two Kenner Fast111s in back, and since he’s not too big on KF1s, and since they’re rather worn, he gave ’em to me gratis. No, you’re not seeing double — the chromed cruiser in front is the same model as the yellow pop-top in back. It’s the exceedingly rare mail-in Promo version, which along with the near-mint black bounder behind it, BTM sold to me for (you didn’t really think I was going to avoid this, did you?) 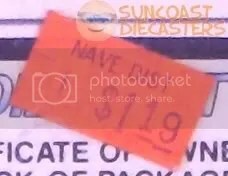 An Embarrassingly Low Price®. The un-twins are Piston Pusher; l’il blackie is Pipe Dreamer, and finally, ol’ yeller is Range Runner. Dune Daddy, sort of aqcuired at our last meeting. I say “sort of” because I actually got it three months ago, but now I can actually keep it. Explanation: This is one of several cars I picked up elsewhere. I had BTM review ’em to see if any were profitable, and several (including this’n) he rated at verious dollar amounts. I actually had two of these, one of which I sold the next month. There was some question about it, since BTM couldn’t pin down the variation. 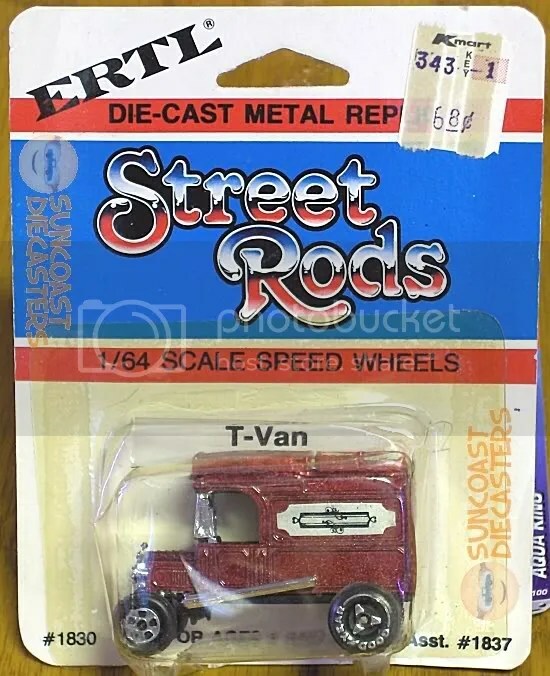 Bill (who knows variations like nobody’s businees) declared it to be from the Wisconsin Toy Company series — which means it’s a particularly rare variation of an already-rare model. 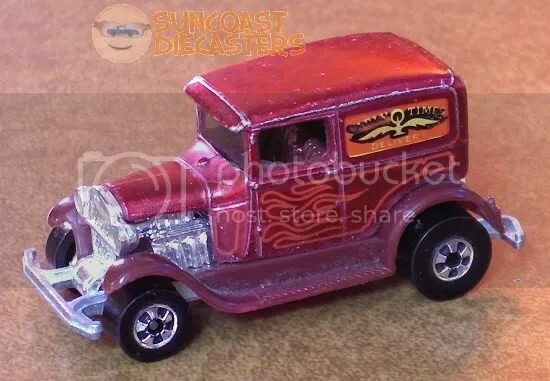 And since I haven’t seen a Wisconsin since the early days of Suncoast Diecasters (check the very first photo in our 2007 Gallery — that’n’s mine), I certainly wanted to keep this one. So, I prayed, “LORD, I’ll set this car on the table next month. If it’s Your will that I can keep, it won’t sell; otherwise it will.” The next meeting came; the car didn’t sell; so, thanks to the LORD, I now have half the Wisconsin series in my collection! It was gettin’ towards the end of the meeting, and I realized I hadn’t seen any of Big Tractor Mike’s new treasures. So, I asked him what he got, so I could photograph it … and he tosses this pile o’ lettuce on the table. Hey, he provided the subject matter, I provided the photography. I am here but to serve. Jet Threat 5.0 is disappointing. Or, it would be, if this were that. But it’s not; it’s simply an adorable l’il pull-back plane which our adorable Original Ken picked when he was being just oh so adorable. –Here’s the answer to that question. Which itself is a question which remains unanswered. We all took turns trying (and failing) to identify the creature in the logo. One said it’s a monkey; another said it’s a pagoda. I said it’s either a cobra, or a cobra-man, or a ninja (or some other Asian warrior) wearing a cobra-styled hood. I was also the first one to point out the stylized W in front of the being. Anyway, here’s a photo of it. 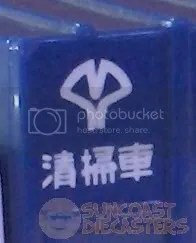 I found a import/export website which listed Chinese companies, but none which Anglicised names started with W featured this logo. Take a stab at it and submit your guess! You can’t be any more wronger than we were! Emergency Backup Ken’s buddy Gary picked up these fair fellow Fords from Your Humble Webmaster. Excellent pairing, Gary! ; well-played! 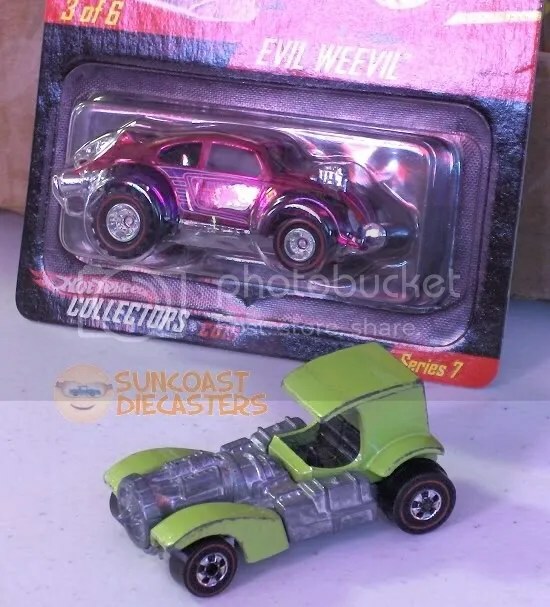 Bill snagged this re-tooled and re-issued Evil Weevil, as well as– …Well, now; who is this curious little green fellow? Bop on over to Bill’s personal gallery to learn more. Tom got quite a prize here. 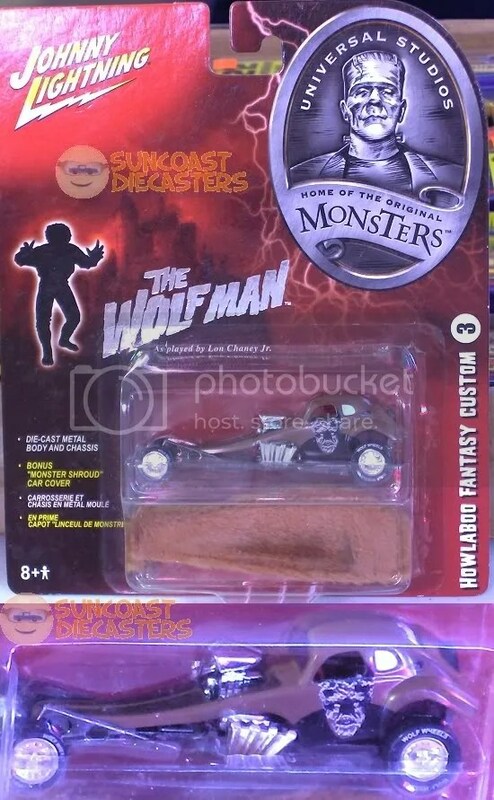 No, I don’t mean a rare JL or the ghoul — er, cool Wolfman livery. No, I’m talking about the base model itself. 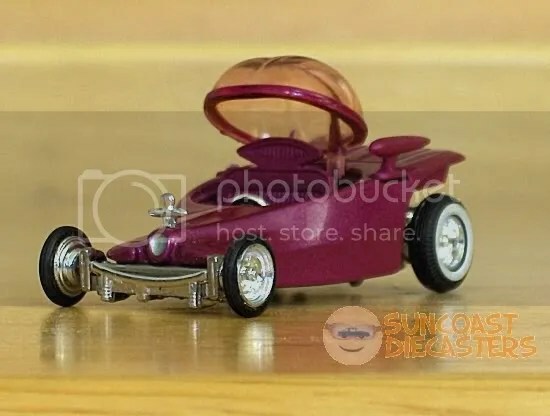 This is a 1/64 replica of the seriously awesome AMT Bugaboo model kit. 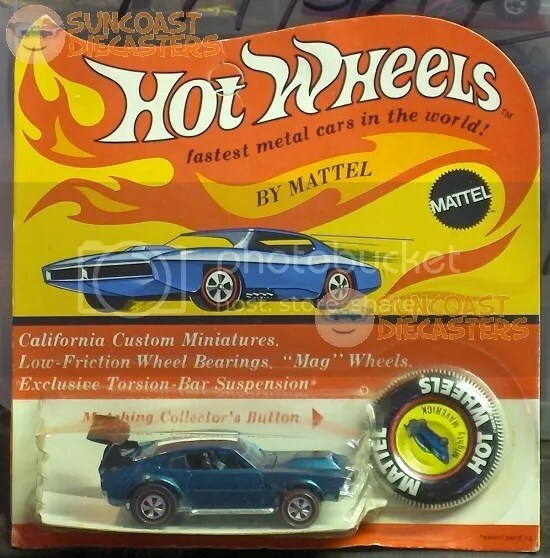 This kit was from that late-’60s / early-’70s era when wild hot rod designs ruled the shelves. It’s also a heartbreaker: I had the Bugaboo kit when I was a kid … If I recall correctly, I eventually busted it somehow, and so threw it away. 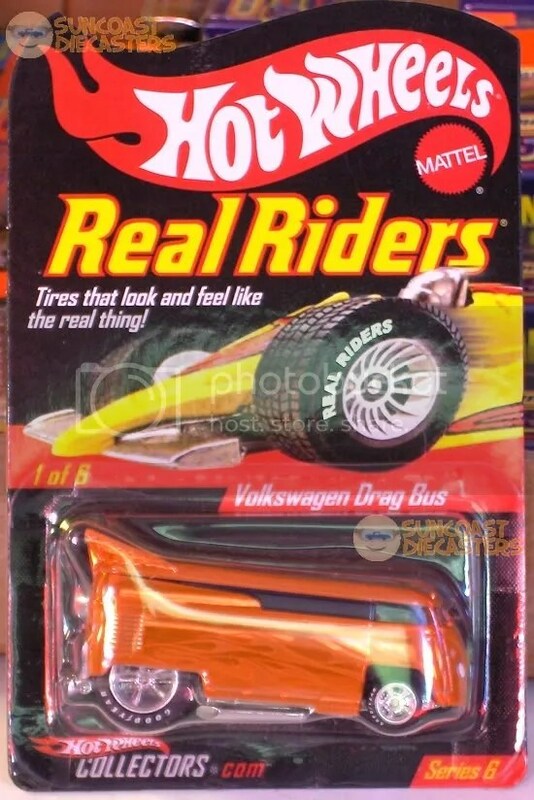 Someone bought this Volkswagen Drag Bus. I don’t remember who. Anyway, here’s the obligatory photograph of it. 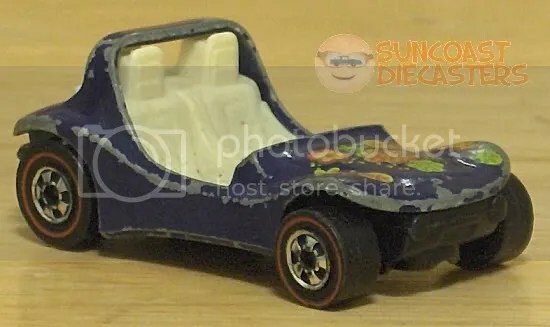 Someone bought this 100% Hot Wheels “Classic Bodies” set. I don’t remember who. Anyway, here’s the obligatory photograph. ZommeEiner gebotten diese Zwei Mercedes. Ich nicht gerembere whuom. Zonderweg, hierein am die obligatierische fotograf. Someone bought these tw– Oh, the heck with it. Thunderbirds are Go! Because you’re such a nice audience, and because I’m a thoughtful Webmaster, I’ve provided this unified set of Kidco close-ups. I’ve provided it also because these cars feature a feature often not featured on the major brands of the same period: opening doors. Another RAOK –Well, half a RAOK, I guess. 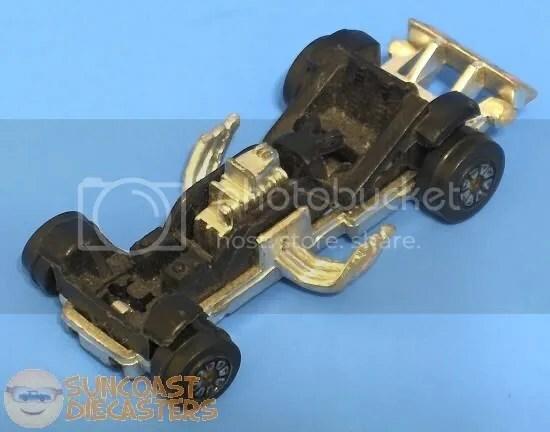 This time from Ken, who knows I am Suncoast Diecasters’ Kaiser of Kenner Fast111s. Which this is. Or was. Mostly. This is, er, was (gaaah!) 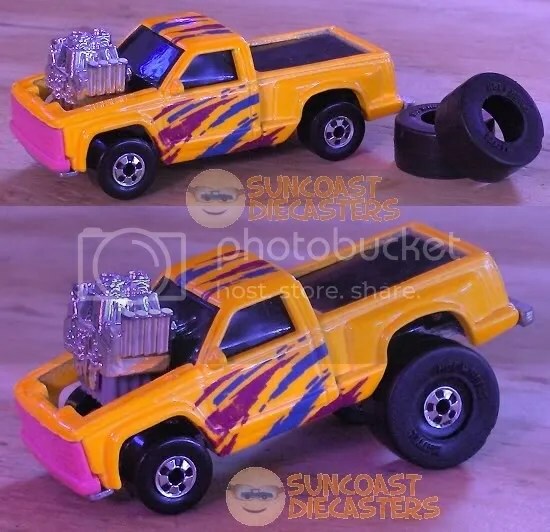 Piston Pusher, a pop-top funny car. Now, one might wonder why I would accept a funny car which so clearly is missing its funny part. Well, first of all, it’s a RAOK from Ken (that alone is enough). Second, when he showed me the KF1 license plate, I got a good laugh out of it. And third, believe it or not I think the model actually looks pretty cool this way. Now, is this ironical or what? While “severely damaged” in the sense that the body shell is as gone as gone could be, not only is the remainder of the car in (comparitively) good shape but its license plate is in superb and utterly legible condition. And no, your eyes are not deceiving you: while the spelling was altered to fit on the plate, it does in fact say “Ah-ooo-gah“! Ken (no, not Original Ken; I’m referring to Emergency Backup Ken) brought in this monster truck. And by monster truck, I do not mean, “Let’s us go mud-stompin’!”. 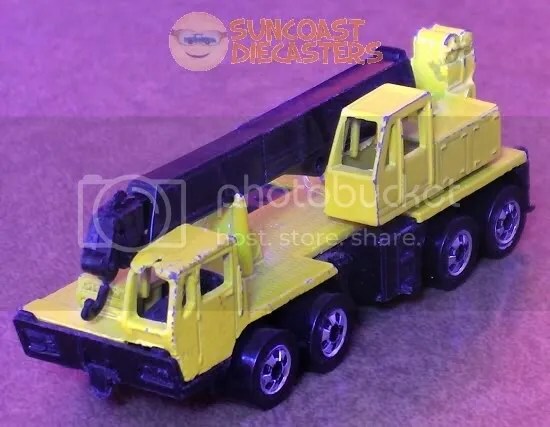 I mean this truck is a monster, at about 9″ long and weighing nearly two pounds. This is some serious metal. Nicely detailed, with a fully articulated catcher-thingy. I brought in a few finds, mainly to get them appraised by Big Tractor Mike so I could decide whether to price ’em on the table or just toss ’em into a box for my nephews. 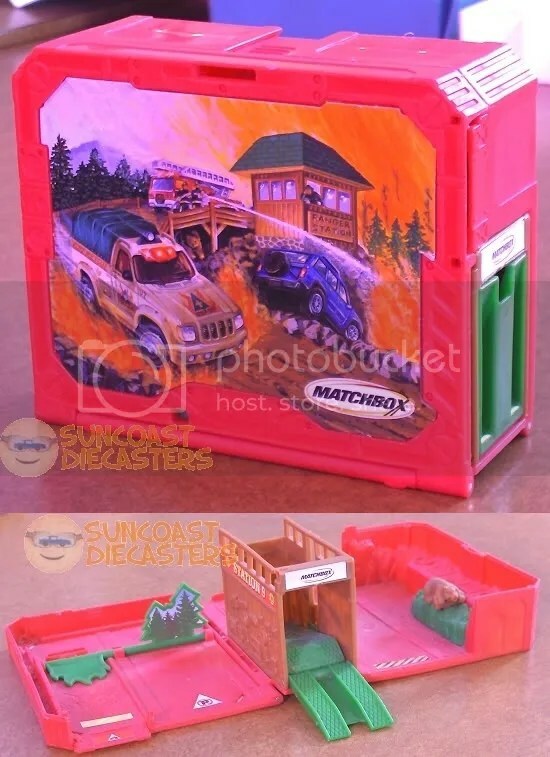 Turns out several items were well-evaluated, including this Matchbox Fire Ranger Station. The results of the appraisal were such that I RAOK’d BTM with this as a thank-you. 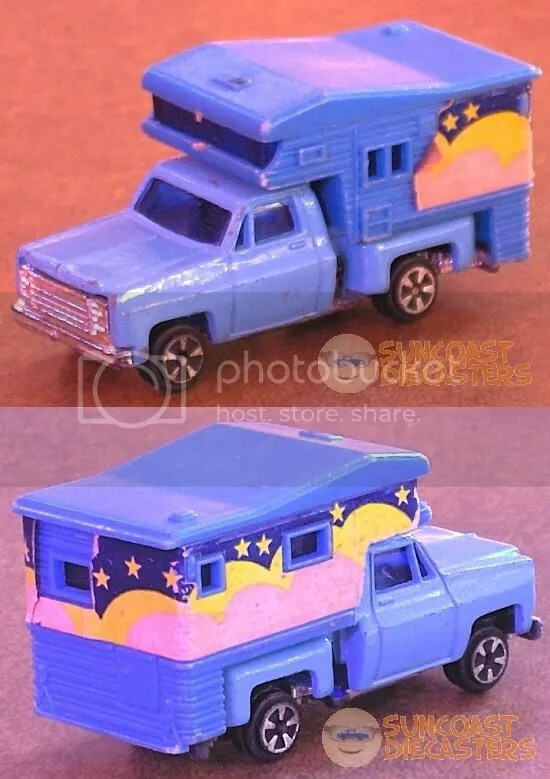 Pick-up Camper, by Kidco. 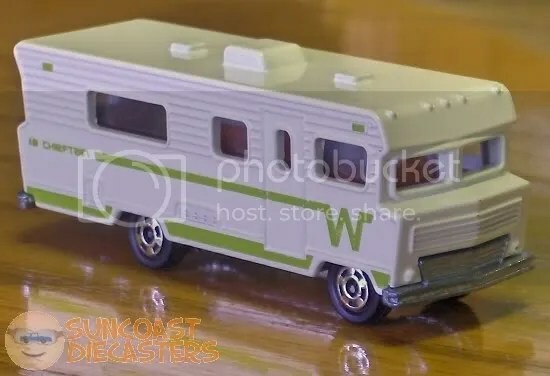 While Hot Wheels offers the semi-futuristic GMC Motorhome, and Matchbox offers the modern-era MBX Motorhome, Kidco provided this classically retro runner with a traditional after-market bolt-on look. Purchased by BTM from me. 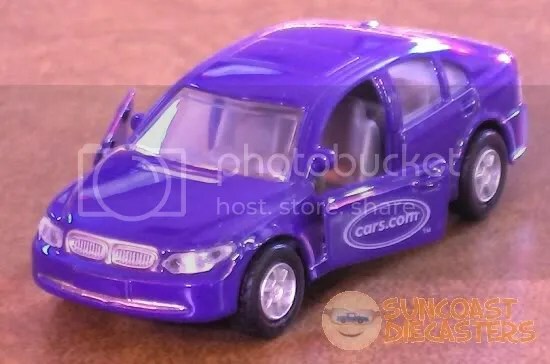 Cars.com promotional. I’m genuinely surprised at the opening doors. Not just a pretty sitter; features several digitally-stored sales pitches, as well as blinking headlights. Purchased by BTM from me. What’s this?!? Heh, a tease from me to tempt you over to Big Tractor Mike’s personal gallery, where a 1/64th-scale bomb of epic proportions was dropped, to the delight of all. And when I say all, I mean just those who were actually there at the time. Things are back to normal, as Tom once’d again is buying Volkswagens. 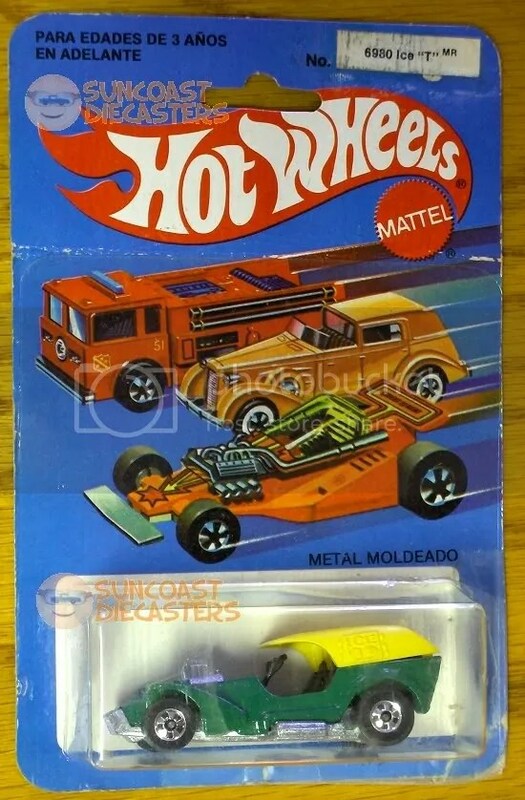 Here he snags a playset with a Beetle, two more Beetles, a T-2 bus, a modern bus and a …um …on-fire thing. 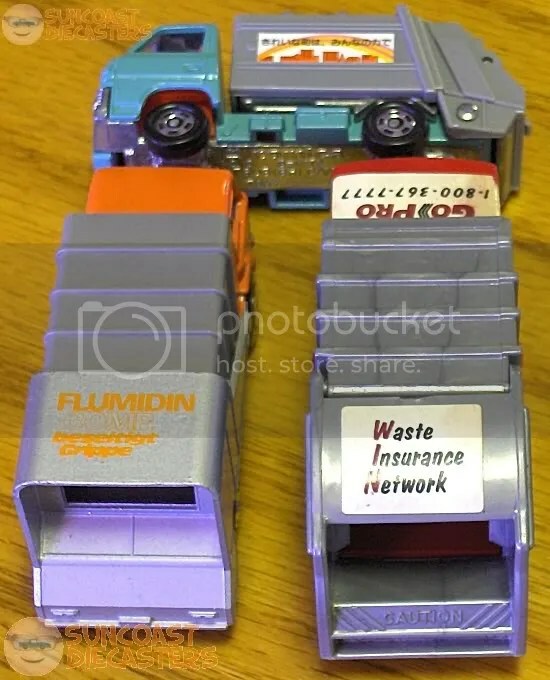 Big Tractor Mike started a new thing: “Pick yer cars an’ make a deal!”, whereby one chooses whatever cars one wants from the bin, and BTM figures out a price. Bill done did pretty well for himself, acquiring these twenty-five items. I’d do a “Bill bagged his own and saved!” joke here, except they were already bagged to begin with. 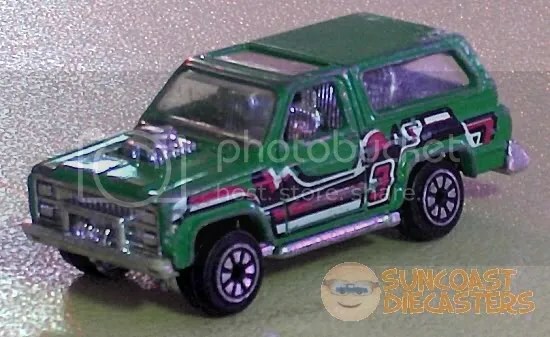 Bill also snagged this Bronco 4-Wheeler. Bill prefers models in high-quality condition (even if they’re thus pricier), and expressed concern about the discoloration of the motorcycle. I told him it looks good because it brings out detail of the bike. 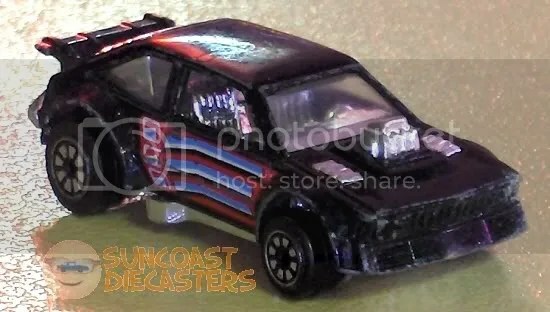 He captured this Redline-era Rear Engine Mongoose as well. Sweet, sweet engine detail. Ken aquired this interesting identity crisis. And I’ll have to wait ’til I see him again to identify it. ‘Coz it ain’t neither a Hi-Raker, nor a Cal Custom. 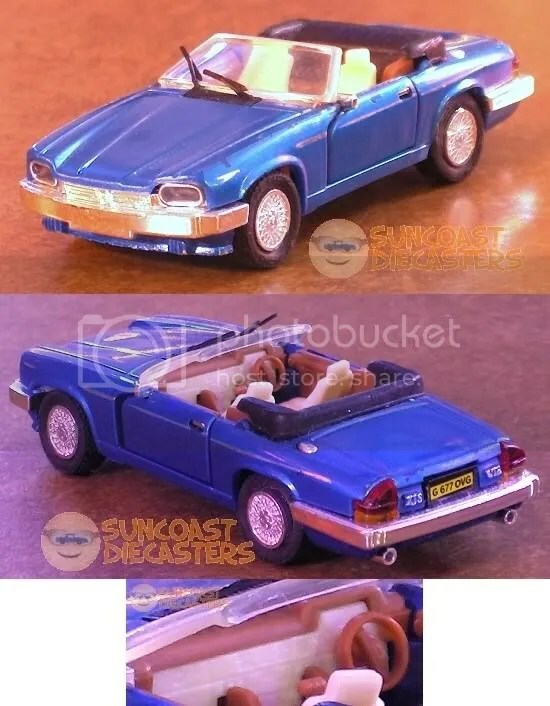 On the other hand, this Ken Kapture is nicely named: Jaguar XJS. 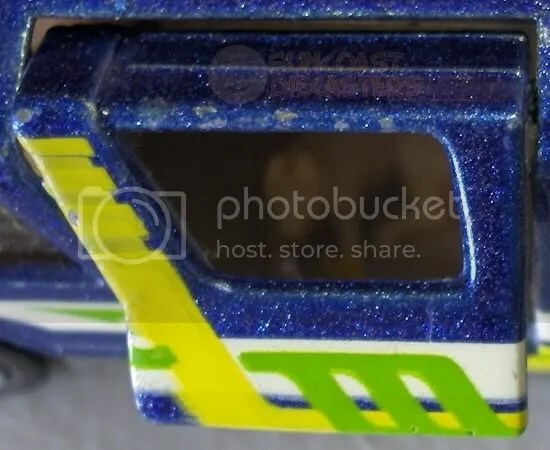 Just check out the awesome and sweet details. 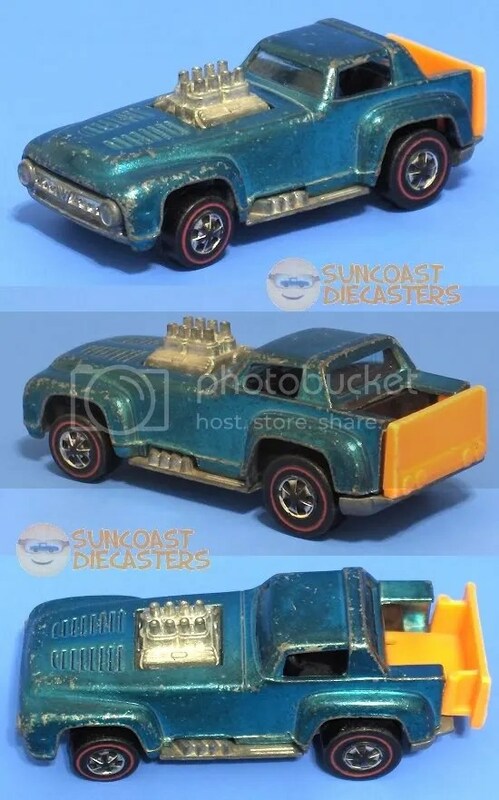 Plastic head- and taillights. Opening doors. Two-tone interior. And separately-molded windshield wipers. And finally, a detailed dash, if you please. And finally, Ken gets something we all want. No, no, not bacon. I mean storage. 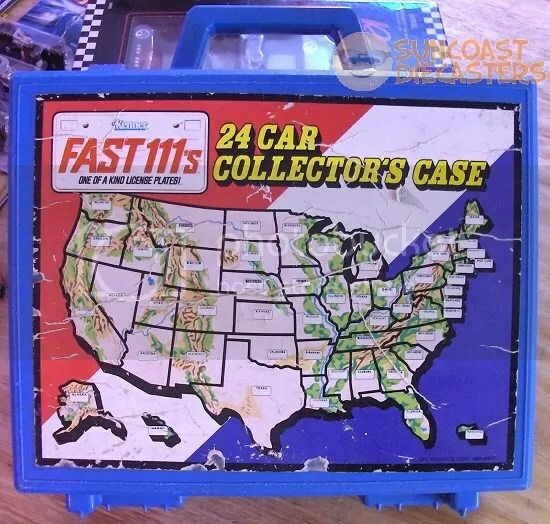 Don’t know the manufacturer of this case, but we know it paid attention to the diecast market of the time: the callout states not only Hot Wheels and Matchbox, but also Fast111s(!). First, let me explain the blue background. Yes, these are from our July meeting; no, the photos are not from the Sports Bar. Since I don’t always bother have an opportunity to charge my camera, I’ve instituted a new policy: I will photograph my new cars last, and if necessary at home, to make sure the other members get their cars photographed during the meeting. 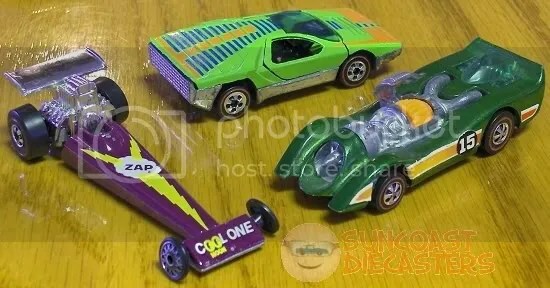 Clockwise from upper left: Dragster; Speed Shark; Flat-Out 442 (with GHOs). Ever since I photographed the Minitrek for Bill’s gallery, I’ve been intrigued. 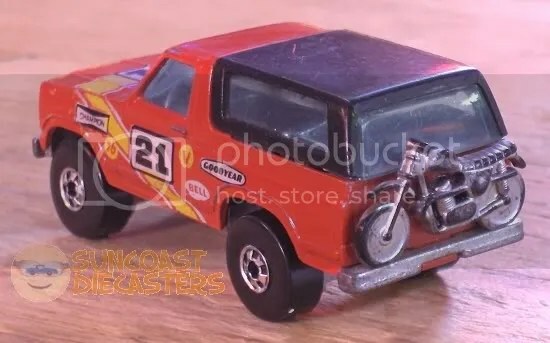 The Minitrek, which is based on the Toyota Hilux, came out in 1981. I don’t remember seeing it, which is a shame, because it’s an attractive and sporty design. Now, thanks to Big Tractor Mike, I gots me one. Swoon… Oh how I loves me some STORAGE! A happy home for my happy (and growing) collection of Fast111s. Ken also did a Wonderful Thing, by finding and then transacting to me this near-MOC (and unpunched!) 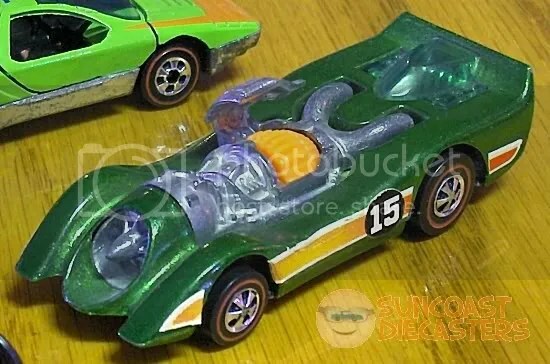 Kenner Fast111s King Cobra, thoughtfully stored in a ProTech Car Case. Related story: Something about this model that struck me odd is the “boxiness” of its design. The packaging is copyrighted 1980. I think of KF1s as “late ’70s”; yet I had always thought that ‘Stangs didn’t get boxy until the mid-80s. However, a quick image search on the Internet (motto: Always Helpful.®) proved that, in fact, the 1980 ‘Stang did suffer, er, feature that boxy look. So, no weird time-trips here, just yet another delicious addition to my collection. Again, unpunched. Hmmm… Seems no Fast111s model could trade hands more than twice. So what happens if you’re the third owner, and you want to sell or trade? 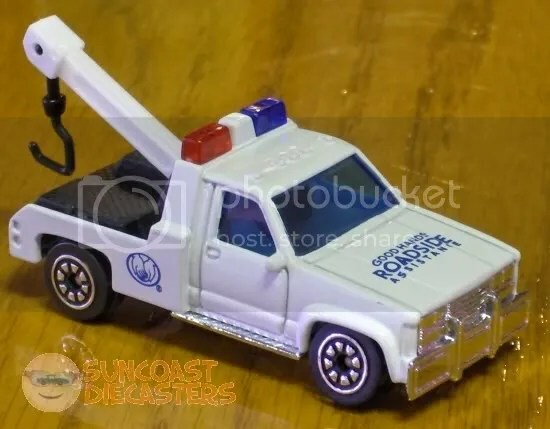 Do you have to call Kenner’s Dept. of Records and ask for a new Certificate of Ownership? Is there a fee? What about depreciation? As I said at the top of my own Member’s Gallery, my high school buddy Jeff collected Fast111s. 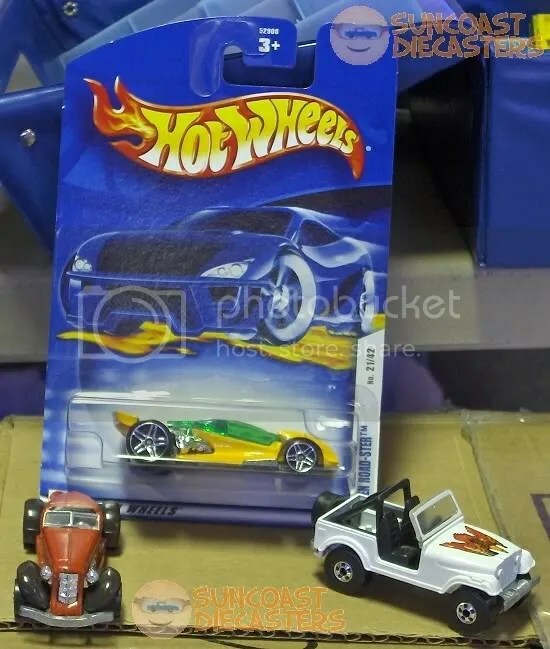 I don’t recall how much Hot Wheels were back then, but I’m curious if any of you remember. Mainly ‘coz I’m curious how the price below compared with HW prices back then. If it was significantly higher, that too certainly would’ve affected KF1s’ success in the market. Mighty Mule. A new, first-time acquisition. I had only seen this model once before, among Ken’s treasures in December of 2010. Now, thanks to BTM, I gots me one of my very own! 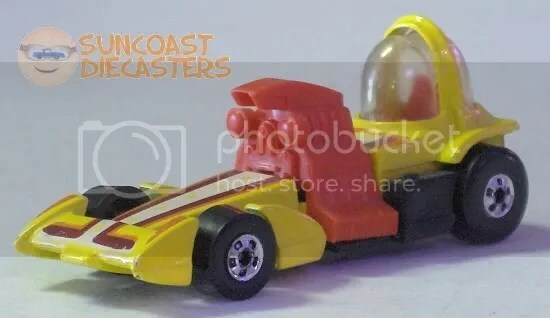 Jet Screamer. Ironically (perhaps), the only other JS I have was also purchased in May, of 2011. And, this one’s tampoes (which, I admit are difficult to see, are only lightning bolts along the exhausts) have different colors from the May ’11 JS — so, now I have “the whole set”, as it were. 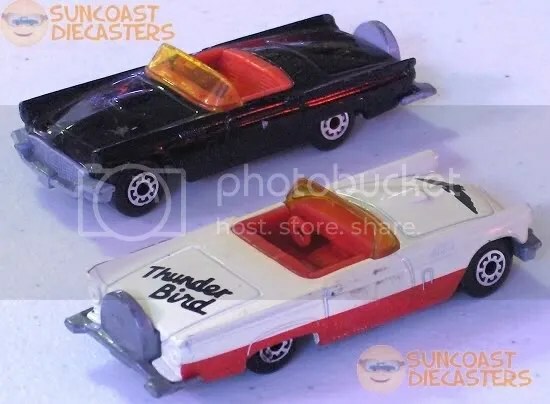 FYI: When I say the whole set in this context, I mean only the two (or, rarely, three) body color and/or tampo variations of each model; I am not referring to ALL FIFTY STATE LICENSE PLATES. Pipe Dreamer. This model is particularly rare, not just in the sense of Fast111s being rare today generally speaking … but also rare in that this is one of the few models to actually include its name. 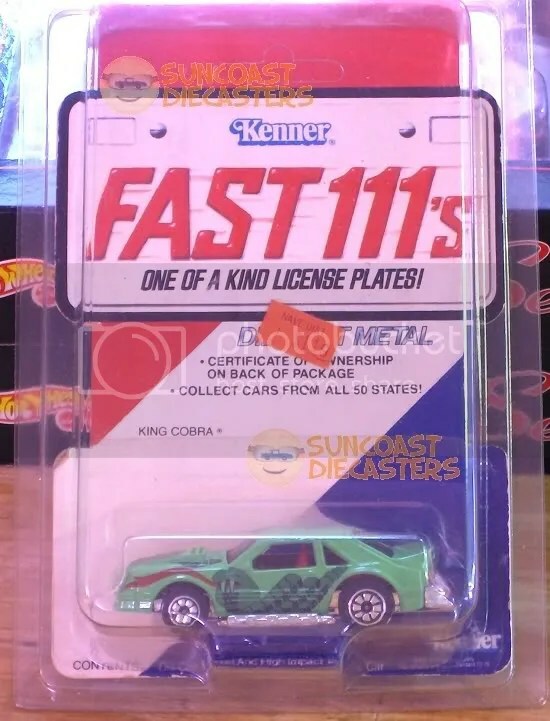 That’s right: unlike Mattel (and most other manufacturers, I presume), when Kenner introduced the Fast111s line, it was decided — quite incomprehensibly — to not emboss the model names on the baseplates. 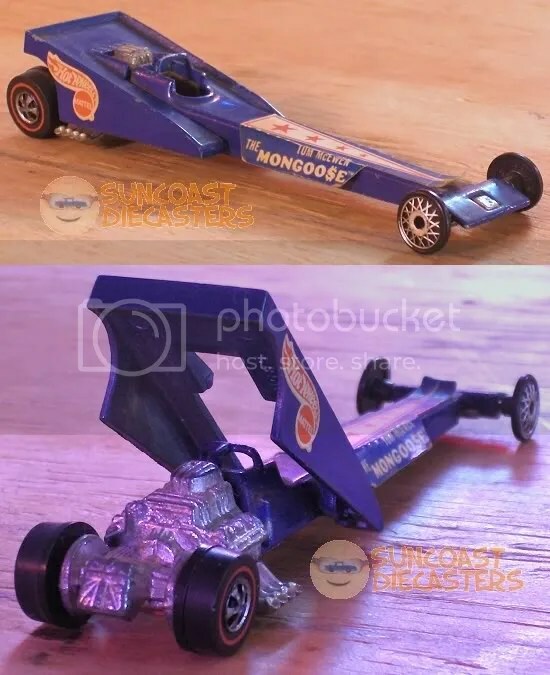 Thus, if as a kid you lost (or your mom threw away) all the packaging from your F1s, you were likely to forget most of the models’ names. And as an adult collector, until and unless someone thoughtfully created a web page covering F1s, you’d never know more than a few by name. And this is one of them. By name. Tom apparently mistook these Porsches for Volkswagens, and so purchased them. This is one of those tormenting purchases. 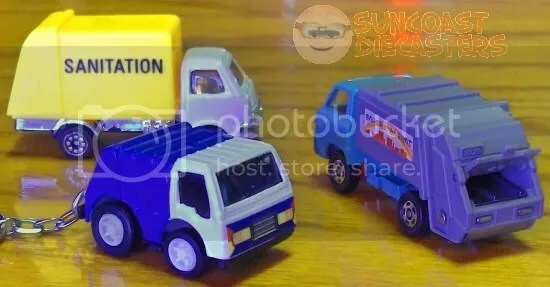 You long to put each of these rides in a special display, perhaps your own custom diorama — yet it’s so sweetly packaged that you dasn’t break it open. Yet, through the magic of digital photography, it’s now possible to allow you to enjoy these models more closely without breaking the seal. Complimentary drool cups are available in the lobby. What can I say? ‘Nother Porsche. 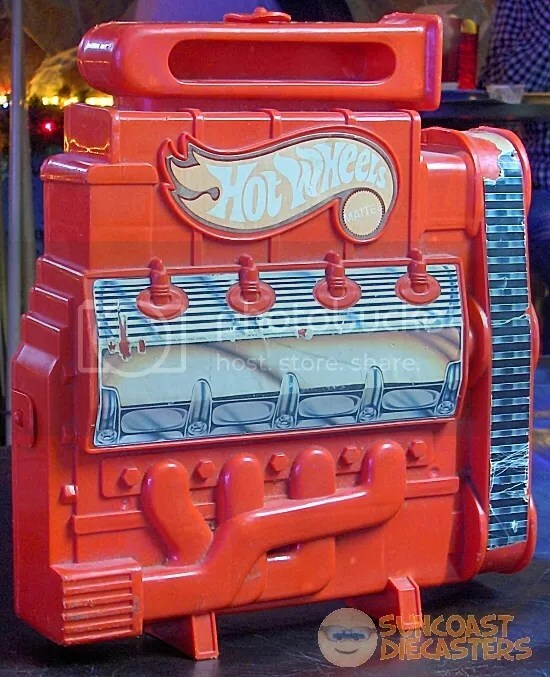 This, by the way, is Road Agent, a kooky kustom by Ed Roth. Oh, you may have noticed in this photo that RA’s right winglet-thingy is broken off. Know what? I can’t hear you over the awesomeness. Oh, yes, This is what I like: wild, crazy, totally spaced-out customs. 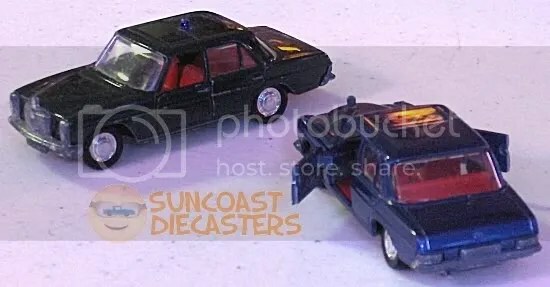 That, and Kenner Fast111s. And pro wrestling. Did I mention the pro wrestling? 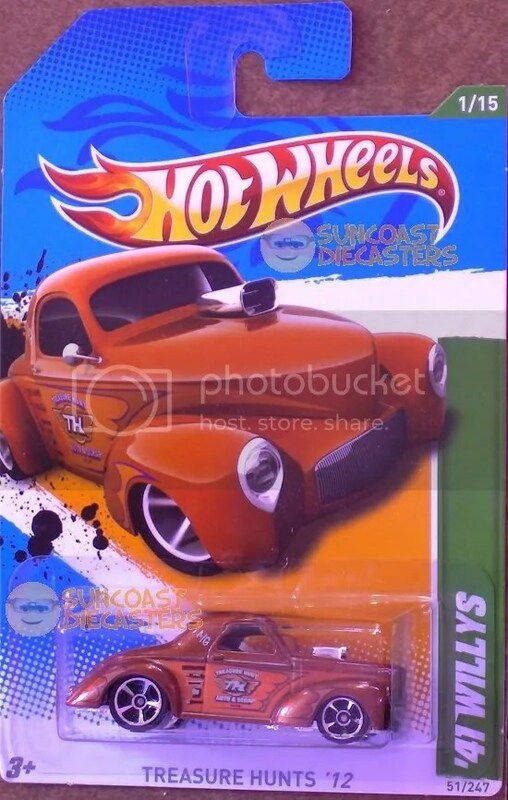 Ken goes all happy with this T-Hunt version of the ’41 Willys. I attempted — strongly — to RAOK him with it, but he eventually shoved some Georges at me and threatened to call in Big Tractor Mike, so I submitted to his Capitalist ways. 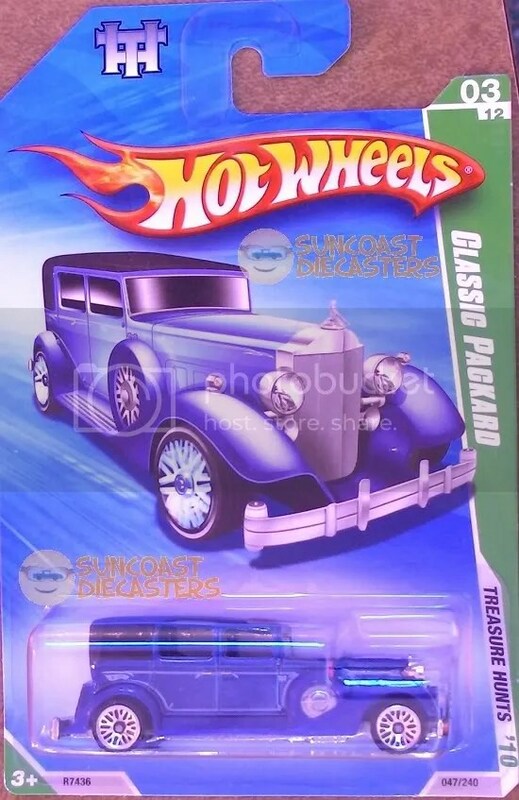 He (Ken) also got this, the T-Hunt version of the Classic Packard. But this one didn’t involve any threats to my person. Ken (yes, Ken, again) also nabs this very pretty version of Larry Wood’s classic A-OK.
Ken (You’re listening to WKEN, all Ken, all the time!) 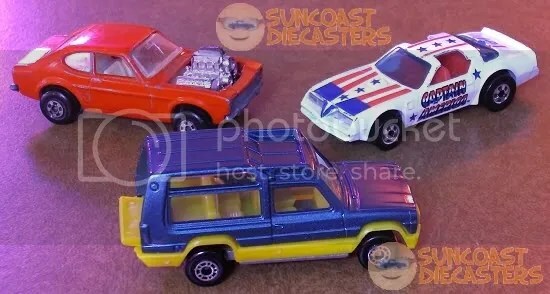 did too also gather (clockwise from upper left) Hot Rocker [Matchbox Rola-Matics]; “Captain America” version of Hot Bird; and the lovely and talented Matra Rancho. 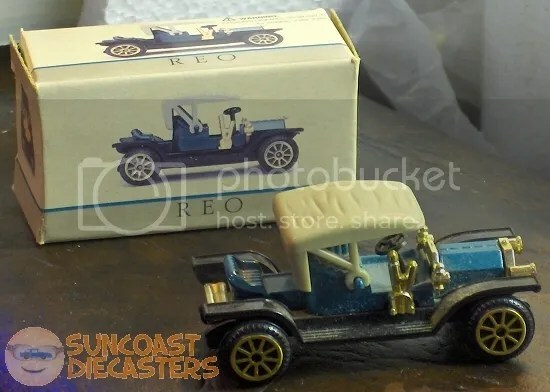 This Rancho, by Matchbox, is nicely appointed, and even features a working drop-gate. Also features the rare (well, to me) “Made in Bulgaria” claim to faim. Er, fame. Ken’s workmate (Yes! Still mostly Ken!) nabbed these Bat-toys. The Batboat has a kind of ’80s look to it. 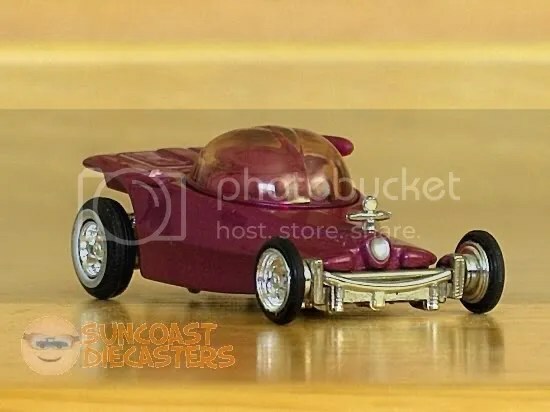 But the Batmobile is the classic Husky/Corgi version with a Rola-Matics-like action: When rolled or pushed, a plastic flame would “flicker” in and out of the turbo exhaust. 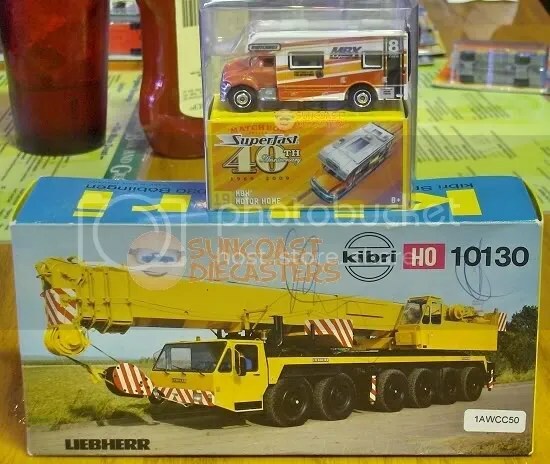 I (yes, I, not you-know who) purchased this awesome Hot Wheels Construction Crane from Penny. 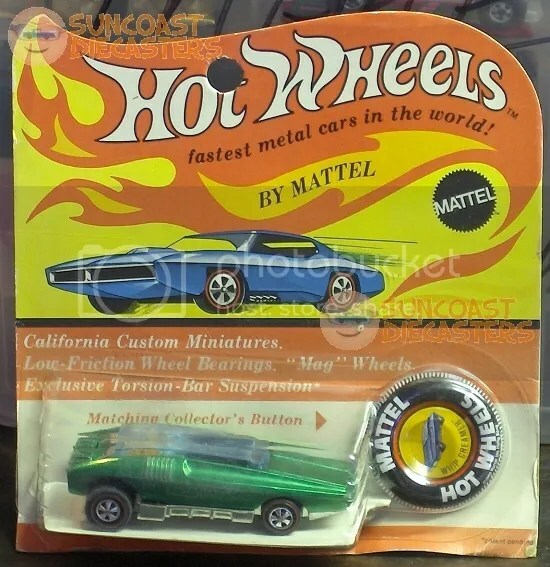 Yes, really, it’s a Hot Wheels, from back in the days When Mattel Actually Cared. From Penny, I also acquired this original-edition Dumpin’ A. I have two (I think) of the second-edition models with the yellow bucket & orange body, but they’re both quite banged up. This’n, while it has its share of dings and scratches, is in far better condition than the ones I already had. Ahh, sweet, sweet victory. American Victory, to be precise. A classic design by Larry Wood. And from the Redline era, no less! (I gotta Redline! I gotta Redline!) 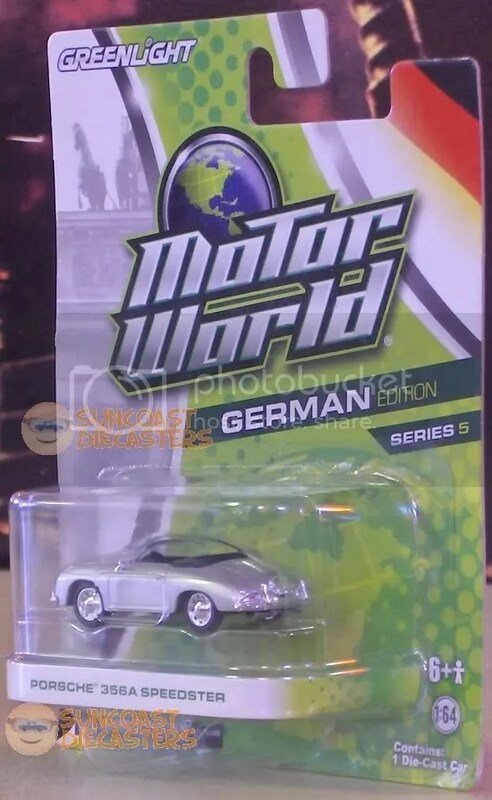 This seems to be the first edition model, as well. Interesting fact: on the base is a proclamation I don’t recall seeing on any other model — “Patented U.S. and Canada”. 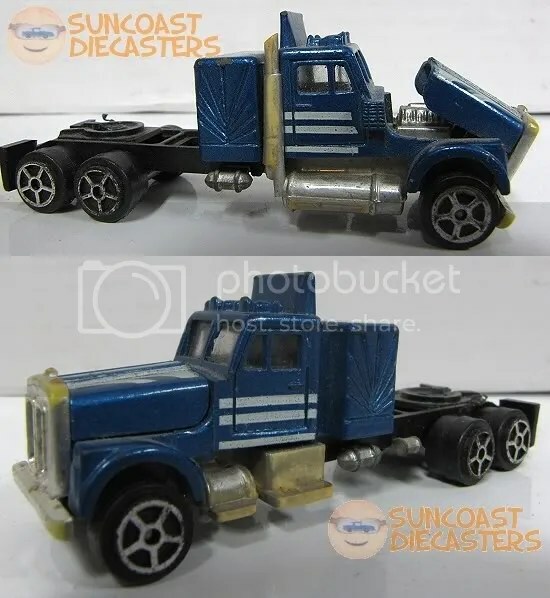 Kenner Fast111s, courtesy Big Tractor Mike. And I do mean courtesy. He offered me these plus two others last month, but I determined that they were models I already had. During the time in between meetings, I reviewed my collection and realized that not only did I have duplicates of several models, I also had threeplicates of several. Further, I realized that could stand to have threeplicates of these two. So I e-mailed Mike and asked him to bring them again in March. At which time he RAOKs me with ’em. Yeah, gratis! What a swell guy! The models, by the way, are Pipe ‘N Hot and Piston Pusher. Another Mike model, this done properly via cash transaction. 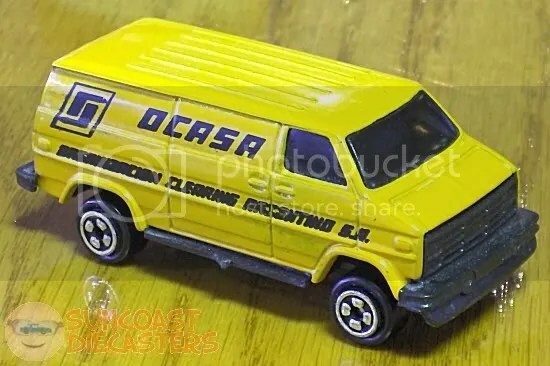 I bought this for several reasons: 1) it’s a Tomica, and I can always use another Tomica; 2) it’s in excellent condition; 3) the price was very reasonable, considering the model’s great condition; and 4) it’s really nicely detailed. 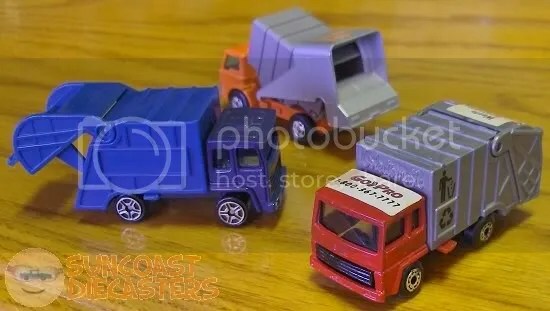 Ken gathered a gaggle of garbage trucks at the last meeting, growing his great collection by … um, a lot. Heck, at this point he might even … Go>>Pro! Heh-heh! See, ‘coz there’s a — never mind. Ken didn’t know what Flumidin is. Well, I found out what it isn’t. Ken said I would laugh. I did. 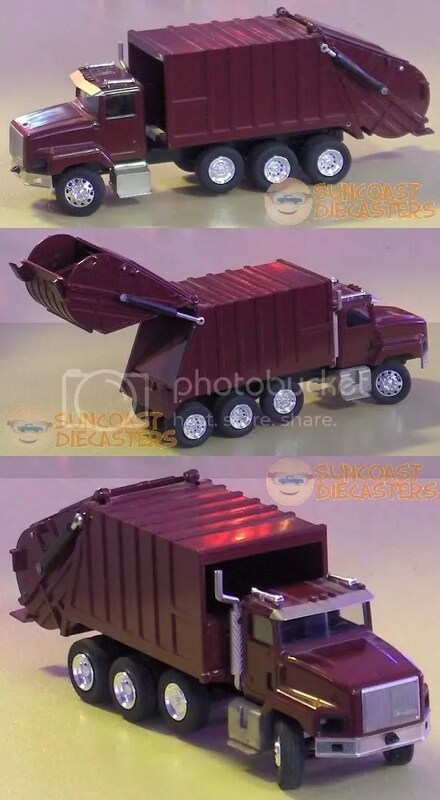 When he set that itty-bitty l’il garbage trucklette on the table, I couldn’t help myself. Ken (not that Ken, the other Ken) had a case of two-for-a-bucks. 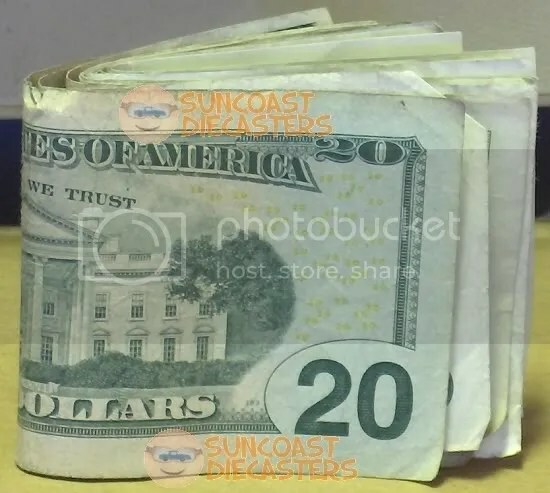 Not wanting to fool with change, I grabbed some other car, and this. Yeah, looks pretty beat up, don’t it? Know what? ; I don’t care. 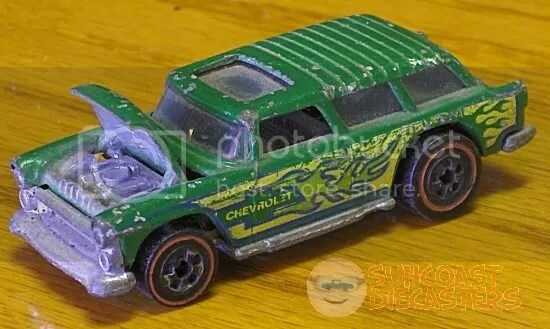 This is Alive ’55 from the 1974 Flying Colors series, it’s from the Redline era, it’s an Embarrassingly Low Price® of a whole different magnitude, it has an opening hood … and it’s-a mine all mine! 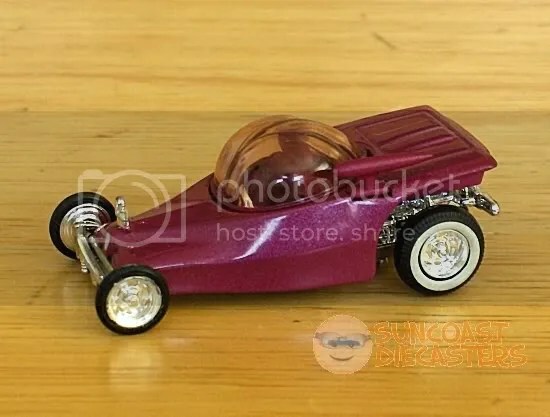 Ken found this … um … uniquely-colored version of Bubble Gunner, which is from the 1983 Speed Machines series. I just … don’t get that engine color at all, man. 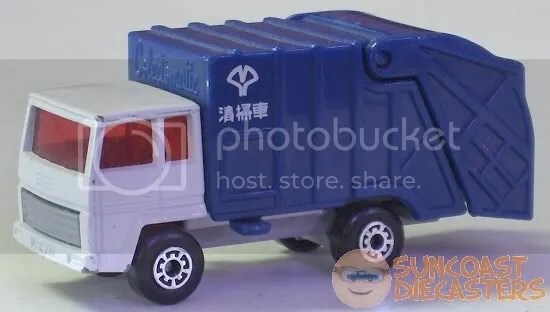 Ah, but Ken and the whole world are back to normal with this, a Matchbox Colectomatic garbage truck. 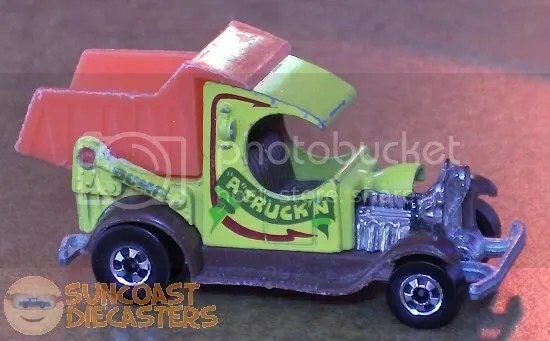 Yes, an honest-to-goodness real (toy) garbage truck. 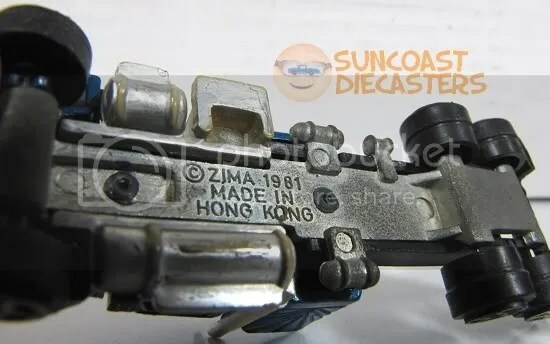 Also unique, in that this one is a reverse of the modern toy car, which is made in China for the American market: this one was made not in China, for the Chinese market. Ah, so! You foreign-language students are gonna have to let me know if this is actual, authentical Chinese writing, or even close. 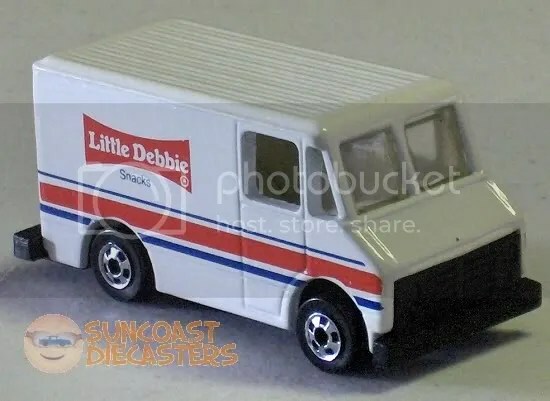 Tom found this Delivery Truck done up in “Little Debbie” livery. As far as I know, this version was only available in the Little Debbie 3-pack (which I have, BTW). So, Tom, where are the other two vehicles … ? Oh man, the Lord was truly smiling on me at this meeting. A new member, Penny, had brought a nice and very varied selection. I had only briefly glanced over it before settin’ up my camera and shooting photos for this month’s gallery. 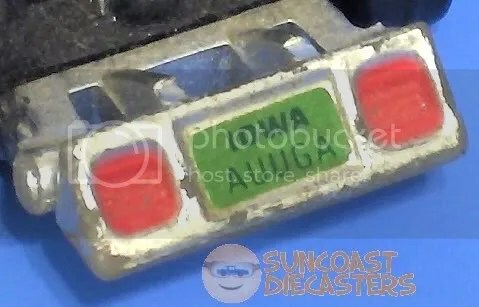 Meanwhile, all the other Diecasters kept going back and looking over her cars. 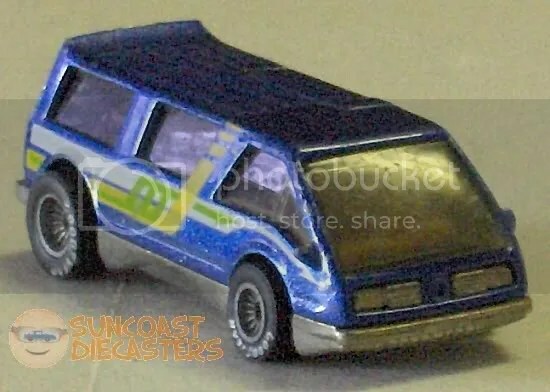 Much later, I decided to take another look — and found this incredible beauty: The Dream Van XGW, from the 1984 Real Riders series. Even after I discovered the working door, there was another surprise left. Bill looked it over and showed me the sleeping dog inside the van. The super-groovy incredibleness of this gift from God is almost too much to bear. Why two shots of that goggie in the window? I wasn’t sure how the photo would turn out, in terms of the dog showing up clearly, so I took several shots using various camera settings. Obviously from the above photo, satisfactory results were achieved. However, despite using a tripod (and not touching the van), I still somehow managed to jostle the camera just so, ending up with these shots just slightly off from each other. So, being a creative genius with an eccentric sense of humor, I did some croppin’ and scalin’, and achieved my goal: a working cross-your-eyes 3D image. Seriously. You’ve seen those funky posters where you cross your eyes and (if you do it right) a 3D image pops out. Same here. And it really really works. Go ahead. Try it. You know you want to…. …It’s a Buby! From Argentina! 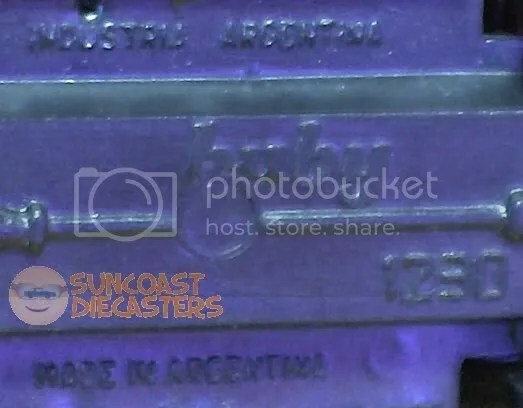 Actually manufactured in Argentina! (No out-sourcing issues there, I guess.) So, how did Ken get this van all the way from Argentina to here? Simple: he towed it! What? WHAT? In an entirely unrelated photo, here Ken acquires a righteous ride from the same series as my too-tall T.
Big Tractor Mike RAOK’d me with this empty box which apparently used to hold GoBots‘ Crain Brain. Yes, I said empty box. Why did I accept it? One very important word: STORAGE! 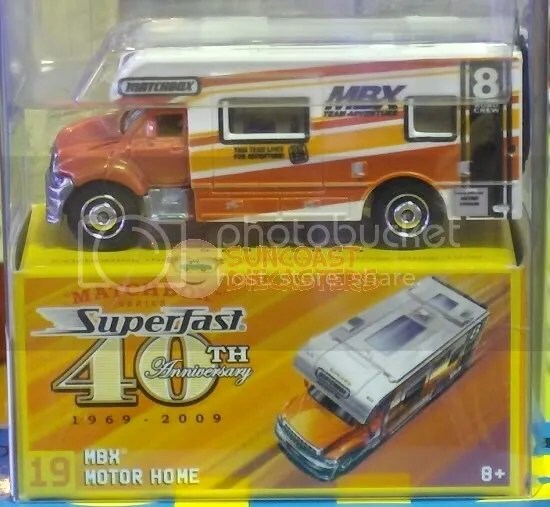 Later I purchased the MBX Motor Home from him because I like the livery. 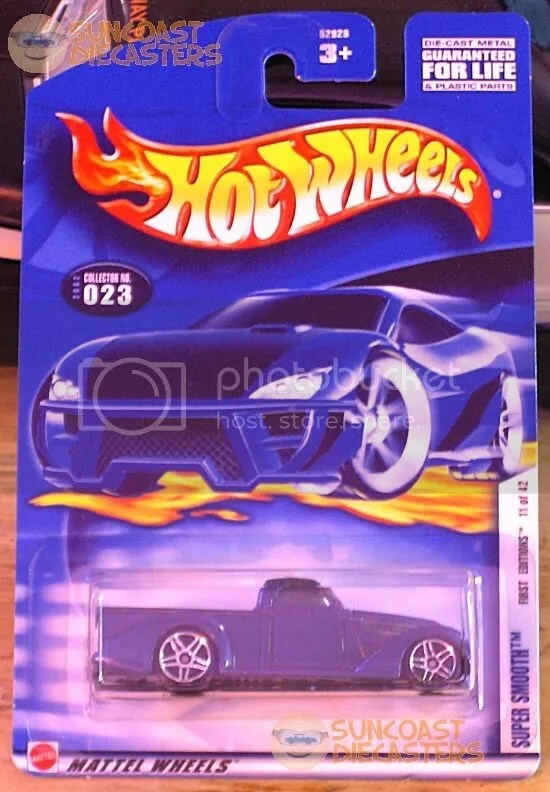 Mike C. picked up this very clean Camaro which is an exclusive from the Double Barrel Stunt set. And to confuse you, here is another white car with a mainly-blue tampo. 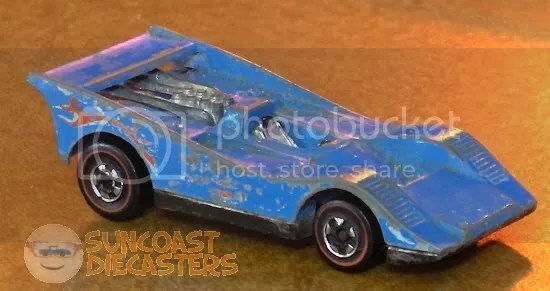 Actually, this is one of Bill’s finds, called Thunderburner. This one with blackwalls is not an easy variation to find. Bill scores big again, with this Mexican variation of Ice-T. I find it interesting that for some foreign markets, an entirely different packaging design is used, while for others such as this one, the packaging is identical to the stateside design (except for the language, of course). Bill scores big again, again, with this trio of Redlines. The Cool-One and Carabo are from the Flying Colors series, while the Jet Threat is from the Spectraflame era.